• Silver Medal in Teams and Bronze Medal in Doubles in World Junior Circuit Held at New Zealand from 11th July to 14th July 2007. 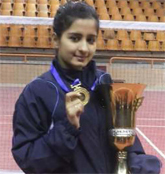 • Participated in Polish Youth Open Championship Held at Poland from 30th May to 3rd June 2007. • Participated in World Junior Circuit Held at Canada from 10th April to 13th April 2007. • Participated in Indian Junior Open Held at Maharashtra, India from 11th September to 14th September 2008. • Participated in The IV International Sports Games “Children of Asia” Held at Neruyngri in Russia. • Participated in 76th Senior National & Inter State Table Tennis Championship Held at Manesar, Gurgaon from 31st jan to 5th feb 2017. • Participated in 76th Senior National & Inter State Table Tennis Championship Held at Puducherry from 12th jan to 17th jan 2015. • Gold Medal in Teams in 74TH Senior National & Inter State Table Tennis Championship Held at Raipur from 7th Jan to 12th Jan 2013.